Filed to: Where is the rebel face?Filed to: Where is the rebel face? Where is the rebel face? These photos (and they are genuine photos, not a photoshops), of Grand Moff Tarkin, were taken in 2011. 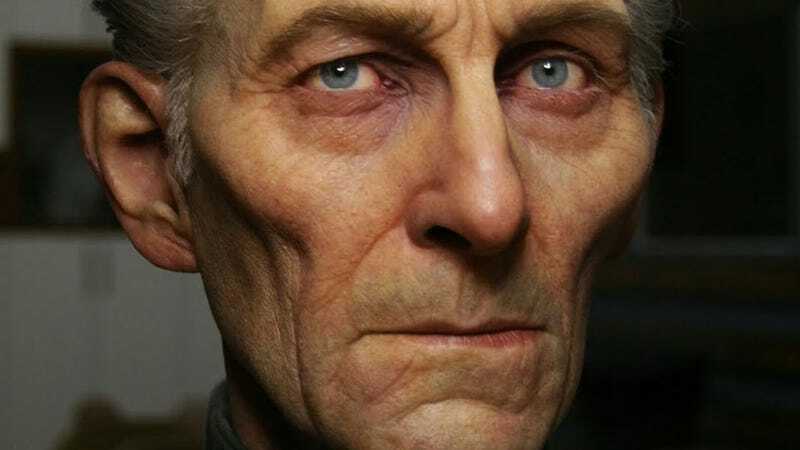 Yet the man who played the Star Wars villain, screen legend Peter Cushing, died in 1994. Because this is a sculpture. A 1:1, lifesize bust of the character, so impressive in its detail and real in its appearance that it's creeping me out the longer I look at it. It was built by artist Jordu Schell, and you need to know the details. The bust itself, including the face, is made of silicone. The eyes are glass, crafted by another artist, David Hoehn. The clothing is genuine and has been tailored to fit the sculpt, while each hair on his head - eyebrows and eyelashes included—was "punched" by hand.